To Cite: Dehghani M, Rezaei M, Shamsedini N, Maleknia H, Javaheri M R. The Effects of Temperature on the Performance of Anaerobic Sequencing Batch Reactor in the Treatment of Synthetic Dairy Wastewater, Jundishapur J Health Sci. 2014 ; 6(4):e23455. doi: 10.5812/jjhs.23455. Background: Low-cost anaerobic sequencing batch reactor (ASBR), which is widely used for controlling high-organic wastewater, is an effective method to remove chemical oxygen demand (COD). Objectives: The main objectives was evaluating the feasibility of using ASBR in the treatment of synthetic dairy wastewater, determining its removal efficiency, and assessing the effect of temperature on operating conditions to remove the COD effectively. Materials and Methods: The present study was conducted at a pilot scale system. Experiments were performed using a 20-L reactor and two storage tanks with the volume of 10 L. The effect of the variation of temperatures (20°C-35°C) and the effect of running cycles (10 runs) on the efficiency of COD removal by the ASBR process were investigated. Four heaters were used to produce the heat of the reactor. At first, raw wastewater in the primary tank was heated to the desirable temperature and then three more heaters continuously produce the heat in the reactor to operate system at the constant operating temperature in each run. Data were analyzed by SPSS 16through Pearson’s correlation coefficient to analyze the association between these parameters. Results: The maximum COD removal rate was 89.7% at the organic loading of 4.5 g/L per day in a 24-hour cycle condition with reaction time of 21 hours and 30 minutes. The maximum biochemical oxygen demand (BOD5) removal rate was 91% and occurred at the first run. The amount of COD removal efficiency was higher at the first run in comparison to the third cycle (27.5%). BOD5 removal efficiency decreased up to 24.4% due to the drop of temperature in the reactor. Pearson correlation analysis showed a significant association between the temperature and the removal efficiencies (P < 0.01). Conclusions: The results of this study indicated that any decrease in the temperature caused reduction in system efficiency of removing BOD5 and COD. Temperature of 35°C is optimal for the removal of high organic load wastewater. ASBR can be used as an effective tool to treat dairy industry wastewater. Anaerobic treatment is particularly wellsuited for high-strength wastewater. Consortium of microorganisms was used to break down complex wastes into volatile fatty acids, acetate, hydrogen, and methane. In addition, the method has a capability to reduce volatile solids by 35% to 60% depending on the operating conditions (1, 2). Application of the anaerobic reactor was used for the treatment of sewage sludge as well as industrial wastewater (3). Severe deterioration of methanogen bacteria was observed, especially with the temperature fluctuations. The variation of temperature more than 1°C per daycauses many problems in the process. Therefore, the temperature should be monitored carefully (4). Methane-generating bacteria are commonly divided into two groups based on temperature requirements for growth. The optimal temperature for the growth of mesophilic bacteria is between 30°C and 40°C. Thermophilic bacteria grow well at the temperature range of 50°C to 60°C. In reactor with temperature below 32°C, the generation of volatile acids is continued whereas the production of methane slows down. When the temperatures is dropped below 21°C, the production of volatile acids is continued rapidly, while the production of methane is almost cut down (4, 5). Dairy wastewater is characterized by its high chemical oxygen demand (COD) and biochemical oxygen demand (BOD) content (6). The conventional activated sludge was used for the treatment of dairy wastewater in many countries. In fact, highenergy costs, operation, and excess of sludge disposal were associated with this type of treatment (7, 8). In this regard, choosing an effective treatment method to remove high organic carbon from industrial wastewater is very crucial (7). Sequencing batch reactor (SBR) was found as an alternative design for conventional biological wastewater treatment (9-11). In anaerobic SBR (ASBR), four treatment phases (feed, react, settle, and draw) are accomplished sequentially in one vessel. The advantages of the ASBR technology are low capital and operating costs, minimum daily maintenance (12-14), and no need for settling tank and sludge recycling. In addition, no significant variation in removal efficiency for highorganic load had made the system very attractive. ASBR has a high potential to remove organic carbon, nitrogen, and phosphors effectively within a single reactor (7). Nowadays, SBR has been also employed as an efficient treatment for domestic wastewater (15). This system has a high capability to remove BOD and suspended solids efficiently (16). Carbon and nitrogen removal by 95% to 98% can be achieved by SBR (17). Many studies have been accomplished on the performance of the SBR (12, 18). Masse et al. indicated the application of four ASBRs operating at 30°Cto remove COD from slaughterhouse wastewater.Total COD was reduced by 90% to 96% at organic loading rates ranging from 2.07 to 4.93 Kg/m3/d (12). Masse et al. demonstrated the effect of temperature fluctuations on the psychrophilic ASBRin treating swine manure. They reported that the removal of total COD was increased by increasing temperature (18). Due to the population growth and increasing per capita consumption of dairy products, dairy industries are developing rapidly. Designing appropriate wastewater treatment is essential for these industries. The low cost of construction and operation of ASBR system with no need for a skilled operator and high efficiency to reduce organic waste, has made ASBR system an attractive option for dairy industries. Since Fars (in Southern part of Iran) enjoys high rank in dairy products in the country during recent years, there is a concern regarding the effect of dairy wastewater effluent in water resources and the environment. Therefore, the objectives of the study were to (i) evaluate the feasibility of using ASBR in treatment of synthetic dairy wastewater, (ii) determine the optimal conditions for maximum COD and BOD5 removal efficiency, and (iii) assess the effect of temperature on operating conditions to remove the COD and BOD5. The effects of temperature and reaction time on the efficiency of ASBR in the treatment of synthetic dairy wastewater were determined based on a pilot study. All the data were presented as mean. The study parameters were temperature and reaction time in the reactor. All chemicals were purchased from Merck (Germany). The experiments were performed in duplicates. In each run of experiments, the samples were taken from the reactor and COD and BOD5 were determined according to the standard method 5220 and 5210, respectively (19). The specification of ASBR is shown in Figure 1. The experiment was performed in a reactor with 20-L volume (with 20-cm width, 20-cm length, and 50-cm height) and two storage tanks with the volume of 10 L. Test was performed in a closed glass reactor with adjustable mixer. The mixing was minimized to prevent the smashing of the sludge floc. Accordingly, mixing was done only for one minute in every 40 minutes of reactor operation time. Two liters of the reactor volume were used for sludge, approximately 10 to 14 L for the wastewater, and the rest for the biogas. Two valves were installed along the heights of the reactor (2.5 and 10 cm from bottom) and were used for sampling the wastewater and sludge. Four heaters were used to produce the heat of the reactor. At first, raw wastewater in the primary tank was heated to the desirable temperature and then three more heaters continuously produce the heat in the reactor to operate system at the constant temperature (20°C, 25°C, and 35°C) in each operation cycle. The operation time for each cycle was 24 hours: filling, 15 minutes; reaction phase, 21 hours and 30 minutes; the settling phase, one ‎hour;decanting, 15 minutes; and idle time, one hour (Figure 2). The used synthetic dairy wastewater was made by adding 110 to 115 g of fat-free dry milk to 100 L of water. The reactor was filled with the wastewater with the COD of ‎‎4500 ± 100‎mg/L. The meanCOD and BOD5 of the wastewater were approximately 4599 mg/L and 3217.5 mg/L, respectively. The fluctuations of the influent wastewater characteristics were due to the addition of different amount of dry milk to the reactor. Synthetic dairy wastewater was made on a weekly basis and kept at 4°C to maintain its quality. The required sludge for the operation of ASBR was collected from the birds’ slaughterhouse sludge tank. To provide methane-generating bacteria, cowmanure was added to the reactor after passing through a filter with diameter of less than 1 mm to remove dirt and fibers. Two liters of the flocculated sludge waste was pumped into the reactor through the influent. In general, there was a 30-day acclimation period for the three operating temperature (20°C, 25°C, and 35°C). For each operating run (three subsequent days), the effluent sample of the bioreactor was analyzed for COD and BOD5. The performance of the reactor was determined for threeconsecutive days for each run. Therefore, we had ten operational runs for the 30 days of acclimation period. Throughout the study, the effluent COD and BOD5 were measured for ten runs during experiment. The COD of the effluent wastewater was monitored throughout the experiment based on sampling periodically once every three days to assure that the microorganisms had achieved the acclimation period and reactor had reached the steady-state condition. In order to monitor the bioreactor to reach the acclimation period, the effluent COD was determined every three days. After 29 days of acclimation, the reactor was performing at the maximum COD removal efficiency of 84.5%. The solid retention time (SRT) for the three operating temperature was 38 days and determined by the amount of excess sludge were wasted. Sludge retention time should be long enough to accommodate the growth of anaerobic bacteria,especially methane-producing bacteria, which is typically longer than 12 days. Reducing the SRT to less than ten days is not recommended because the bacteria cells would washed out before treating the waste. After the acclimation period, the ratio of mixed liquor volatile suspended solids (MVLSS) to total mixed liquor suspended solids (MLSS) was 0.61. The amount of MLVSS and MLSS were within the permitted limit ‎‎(10 to 30 ‎g/L) to enrich anaerobic treatment. According to Figure 3, the mean and maximum of COD removal in the first run were 88.7% and 89.7%, ‎respectively, that were in a desirable level for the anaerobic systems. ‎In the second run, the COD of the influent wastewater was 4598.5 mg/L and the average and maximum of COD removal were 67.6% and 70.9%, respectively. The COD removal efficiency of the system for the third run was reduced to 62.2% ‎‎ (Figure 3). Figure 3 shows the trend for COD removal efficiency of the system for all operating runs. Based on data, the removal efficiency was decreased by 26.5% from the first through the third phase due to the drop in the reactor's temperature. The mean of the raw wastewater BOD5 in the first operation ‎phase was 3217.5 mg/L. According to Figure 4, the mean and maximum of BOD5 removal in the first run were 89.5% and 91%, ‎respectively. The ratio of BOD5 to COD in this study was 0.7 (Table 1). Since the reactor performance was operating at the suitable condition during each run (C:N:P = 152:7:1), there was no need to add additional nitrogen and phosphorous sources. a Abbreviation: BOD5,biochemical oxygen demand; and COD,chemical oxygen demand. The average BOD5 of the influent wastewater in the second and third phases of the system operation were 3252 mg/L and 3255 mg/L, respectively. Figure 4 shows the trend for BOD5 removal efficiency of the system for all operating runs. The mean and maximum of BOD5 removal for the second run were 69.2% and 71.4%, respectively, and for the third run were 65.1% and 66.6%, respectively (Figure 4). From the first through the third phase, the removal efficiency decreased by 24.4% due to the drop in the reactor's temperature. Industrial wastewaters are one of the most important water pollution problems. They usually contain large fraction of organic compounds that act as a substrate for microorganisms when they released into water resources. Dairy wastewater is of great concern because of containing high-carbonaceous and nitrogenous compounds (20, 21). Mahvi showed more than 90% BOD removal in SBR system while the modifications of the conventional activated sludge were capable of removing BOD by 60% to 95% (16). Gutiérrez et al. showed that the soluble COD (SCOD) removal efficiency at 4.5 hours of aeration ranged from 93% to 99% during ten months of operation in SBR system. The average effluent SCOD was 85 mg/L. The BOD5/COD ratio was approximately 0.15 indicating that considerable amount of organic matters in the wastewater were not biodegradable (15). Based on the results of current study, the BOD5/COD ratio was 0.7 that indicated the biodegradability of the synthetic wastewater and the high feasibility of using biological wastewater treatment to remove high-load organic pollutants. ‎Mohseni and Bazari showed more than 90% efficiency of COD removal with the influent COD concentration of 400 to 2500 mg/L and MLVSS of 3000 mg/L using SBR system (7). Zinatizadeh et al. reported efficiencies of 99.5% and 39% removal for the wastewater with COD (5000-1000 mg/L) using SBR process with 18 hours aeration time and 30 minute/hour aeration, respectively (22, 23). Kundu et al. revealed the major removal of SCOD took place within four or five hours of aerobic reaction period by SBR treatment of slaughter house wastewater (9). Another study achieved the COD and BOD5 removal efficiencies of more than 80% and 90%, respectively, at high organic loading rate of 1.18 to 2.36 kg COD/m3/d using SBR for the treatment of piggery wastewater (24). Masse et al. demonstrated that total COD was reduced by 96% at organic loading rates of 4.93 kg/m3/d with a hydraulic retention time of two days using ASBR for the treatment of slaughterhouse (12). According to our results, the mean and maximum of COD removal efficiency were 88.7% and 89.7%, respectively. Moreover, the maximum of BOD5 removal efficiency was 91%. The present study demonstrates that COD and BOD5 were substantially reduced in SBR system using anaerobic process. In general, organic matter is converted to methane and carbon dioxide by a series of anaerobic bacteria in anaerobic treatment. Temperature in anaerobic digester should be monitored carefully to prevent the growth of undesirable bacteria. High performance in anaerobic treatment is achieved at neutral pH and mesophilic temperature. Keeping uniform temperature throughout the reactor is very important to prevent the formation of high-temperature spot. Therefore, mixing is also an important parameter to maintain a homogeneous temperature throughout the reactor. The activity of anaerobic bacteria especially methane-generating bacteria was reduced by temperature drop. Masse et al. reported the effect of temperature on the reduction of SCOD using psychrophilic ASBR during the first runs; however,temperature had not substantial effects on the performance and stability of the process after seven days (18). The results obtained in this study showed that by increasing the temperature, the COD and BOD5 removal efficiencies were increased at different runs of the system operation. It can be concluded that the optimum temperature to activate methane-generating bacteria to remove maximum BOD5 from the synthetic dairy wastewater is 35°C, which was achieved in the first operation phase of the system. The maximum rate of COD removal (89.7%) was obtained with the loading of 4.5 g/L/d at the reaction time of 21 hours and 30 minutes. The maximum rate of BOD5 removal (91%) was achieved in the first phase. Other studies have reached the same result (4, 25). Rodrigues et al. showed that SCOD removal efficiency of 89% at the optimal temperature of 37°C using ASBR system. High bioavailability of soluble organic carbon was due to solubilization and hydrolysis of particulate organic matter. 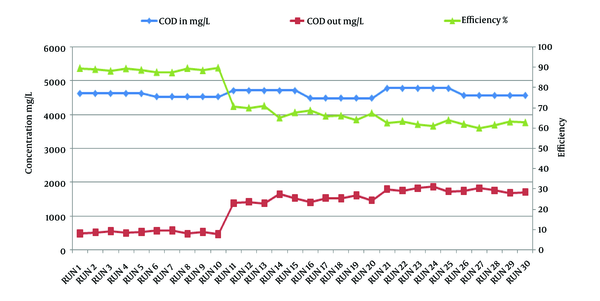 However, total COD removal efficiency was decreased (53%) after 31 days of operation (25). In addition, our results demonstrated the high flexibility and excellent performance of ASBR in removing easily biodegradable dairy wastewater. Moreover, the average effluent COD (518.2 mg/L) in all the operating runs of the reactor was more than the ‎standard set for using wastewater effluent for irrigation purpose in the agricultural‎. Therefore, ASBR can be used as a pretreatment unit for the removal of dairy wastewater with medium to high organic load pollution level. In conclusion, operating system parameters at the optimal condition can provide COD and BOD5 removal efficiency of more than 89% and 90%, respectively. The optimal temperature to achieve the maximum removal efficiency was 35°C. The results indicated the effectiveness of ASBR for the treatment of the synthetic dairy wastewaters. Moreover, our results demonstrated the feasibility of the ASBR system as a reliable pretreatment system to treat dairy wastewater. Due to the relatively high efficiency, simplicity, and relatively low cost of the ASBR system, the method can be considered as a reliable, flexible, fast, effective, and economic pretreatment method for the removal of dairy wastewaters. The ASBR technique alone is unable to meet the effluent limit for applying in the agricultural purposes. The followings are some useful recommendations for further research to enhance the removal efficiency of dairy wastewater. 1. Post treatment method such as ASBR or advanced chemical processes should be used to meet the effluent limit. 2. The performance of the bioreactor should be at the temperature of 50°C to 60°C to enhance the growth of thermophilic bacteria. 3. Mixing by reusing biogas, effluent recirculation, and magnetic systems can affect the bacterial activity and smashing the sludge flocs. The authors would like to thank the Deputy of Research and Technology of Shiraz University of Medical Sciences for supporting the research project (93-8057-21-01). 25. Rodrigues AC, Ferraz A, Alonso JM. Evaluation of The Potential of an Anaerobic Sequencing Batch Reactor for The Treatment of Dairy Wastewaters.